Shahir’s $10 dinner will leave you full and satisfied — and you’ll have lots of leftovers for work the next day. If you are on a budget, but have a lot of mouths to feed, this is the recipe for you! Shahir’s $10 Egyptian Falafel Platter is also great for an inexpensive but impressive dinner party. Preheat oven to 375F. In a large food processor, pulse the soaked fava beans 5-6 times, until they resemble coarse wet sand. Add the rest of the ingredients and pulse until combined but not yet pureed, season with salt to taste. 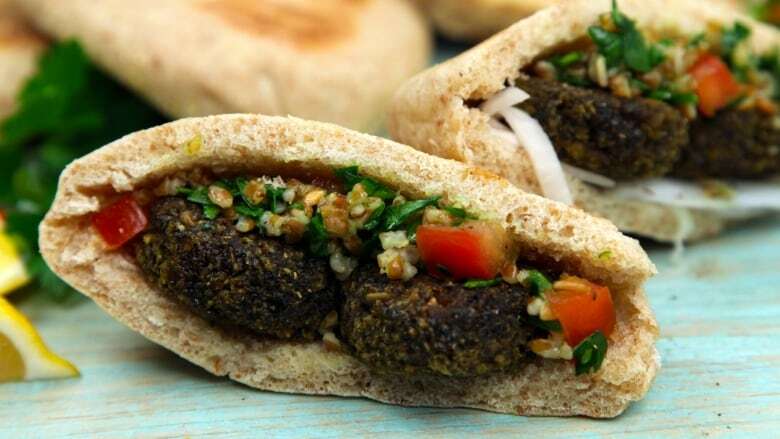 On a parchment lined baking sheet, spoon out falafel mix about a tablespoon at a time and shape into patties. Bake in preheated oven until golden brown and crispy, 18-20 minutes. Serve in fresh pita with tabbouleh, pickled turnips, sliced onions sprinkled with sumac and yogurt. In a large measuring cup, combine yeast and water, set aside until activated and foamy. In a large bowl combine both flours and salt with a whisk. Pour in yeast-water mixture and mix with a wooden spoon until a shaggy dough forms. Turn dough out onto a well-floured surface. Knead the dough until it is smooth and elastic, approximately 10 minutes. Place dough in an oiled bowl, cover and set aside to rise in a warm spot for one hour. Turn to dough out onto a well-floured surface and divide into 16 even pieces. Shape the dough into balls, and then roll out with a rolling pin into approximately 4” patties. Let dough rise covered on a cornmeal dusted baking sheet for thirty minutes. Heat a cast iron pan over medium heat. Place a piece of dough, cornmeal side down on the pan and let cook until the bottom is golden brown and starting to char, 4-5 minutes. Flip over and cook on the other side until the pita is cooked through, another 3-4 minutes. Repeat with the remaining pita dough. Before rolling out the dough, place a pizza stone in the bottom of the oven and preheat to 500F. When dough is proofed, place the dough on the pizza stone. Bake until pitas are risen and puffy, checking the bottom after 5 minutes. Flip the pita and cook on the other side about 5 minutes. Remove from oven when cooked through. Place turnips in mason jar. Combine the rest of the ingredients in a small pot and bring to a boil. Remove from heat and cool for 5 minutes. Pour brine over turnips, adding more water if needed to submerge the turnips. Cool to room temperature, cover and store in the refrigerator until needed for use. Will be good for up to 2 weeks. Combine all ingredients in a large bowl and season to taste.